Speculation has been mounting about the whereabouts of China’s Vice-President Xi Jinping, who has not been seen for over a week. Xi Jinping cancelled a meeting with the visiting Danish prime minister on Monday – his fourth missed appointment. He also failed to attend an important Communist Party meeting on Friday. Xi Jinping is expected to be appointed China’s president at a party congress next month that will see major changes in the top echelons of leadership. However, no date has been set for the meeting, fuelling reports that power struggles in the leadership have yet to be resolved. Journalists had been given several days’ notice of Xi Jinping’s scheduled meeting with Denmark’s Helle Thorning-Schmidt on Monday, but the planned talks were taken off the programme. Last Wednesday, he abruptly called off a meeting with US Secretary of State Hillary Clinton. On a visit to Washington earlier this year Xi Jinping was given a reception benefiting a head of state. He has also missed appointments with Singapore’s prime minister and a Russian official. A spokesman for China’s foreign ministry evaded questions about Xi Jinping’s absence at a briefing on Monday, according to reports, saying he had “no information” to provide. “We have told everybody everything,” Hong Lei said, when pressed. In response, there has been an inevitable wave of rumors, with explanations on news sites and Twitter ranging from Xi Jinping’s possible involvement in a car accident to a power struggle. Earlier on when Xi Jinping missed his meeting with Hillary Clinton, rumors circulated online that he had injured his back while playing sports – suggestions ranged from football to swimming and golf. Yet another rumor said he may have suffered a mild heart attack. Attempts to search Xi Jinping’s name on Chinese micro-blogging sites are now blocked. Xi Jinping is predicted to take the helm from current Chinese President Hu Jintao at the party congress, expected to take place in the second half of October. But the dates of the meeting have yet to be announced, prompting speculation that some of the seats on the nine-strong politburo Standing Committee remain unallocated. There have also been suggestions that the number of seats may be reduced from the current nine to seven. Beijing has been shaken in recent months by its biggest political scandal in years with the dismissal of a rising star, Bo Xilai, after his wife, Gu Kailai, was investigated for and later convicted of the murder of a British businessman. 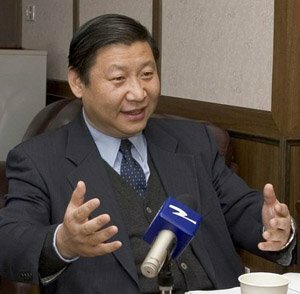 Xi Jinping may merely be suffering from a bad back, as some of the more mundane rumors suggest. But the secretive nature of the leadership and the febrile atmosphere in Beijing mean there is growing uncertainty about the long-awaited change in leadership to a new generation.